Not only am I going to showcase a new stencil, there will be a total of 4 NEW POSTS this week on different setups I used with it. I have been DIYing behind the scenes and it’s been so hard to wait to show you all this fun stuff! A few days before Christmas. I had been visiting my son’s apartment and noted he didn’t have an established place for paperwork, I grabbed a shallow box lid, plunked every little piece of paper inside and slid the works into one of the kitchen cupboards as a make-shift drawer. Well… the DIYer in me had some thinkin’ to do! So once I got home, I stared at a curb side found coffee table I had stowed away for a rainy day. It hadn’t worked for any of my previous brainstorms and I was just about to place it on the curb myself. Yet I couldn’t let it go because I loved the fret work on the sides. That’s when I visioned this thing on longer legs… it was the perfect size for a small desk! Glancing at the calendar, I didn’t have much time. While you were wrapping presents and baking cookies, I was spending a few late nights in a very messy workshop and photo studio, taking pictures ON Christmas Day no less right before I delivered it! But it was well worth the effort. In just a few days, my son had a really cool flip-up desk that fit perfectly in his place, and I had a gift to give… thank goodness for in-house shopping! 1. 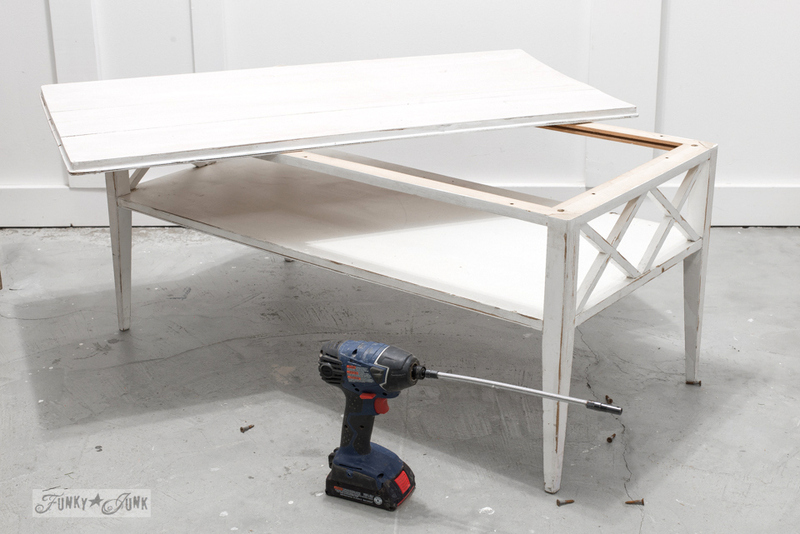 Remove the top of a coffee table from its frame. Since the screws attaching the top were placed in a weird position that wouldn’t warrant a cordless drill getting inside, I found this long spring-like extension in my cordless drill kit. It bent perfectly and worked like a charm! I’ve had it for years but hadn’t even guessed where I’d need such a thing. Now I know! 2. The legs were cut off to achieve a cleaner profile. I nearly left the legs intact, figuring they could help support the leg boards I was about to attach. It would have worked, however I ultimately decided to get rid of them for a more streamlined look. 3. 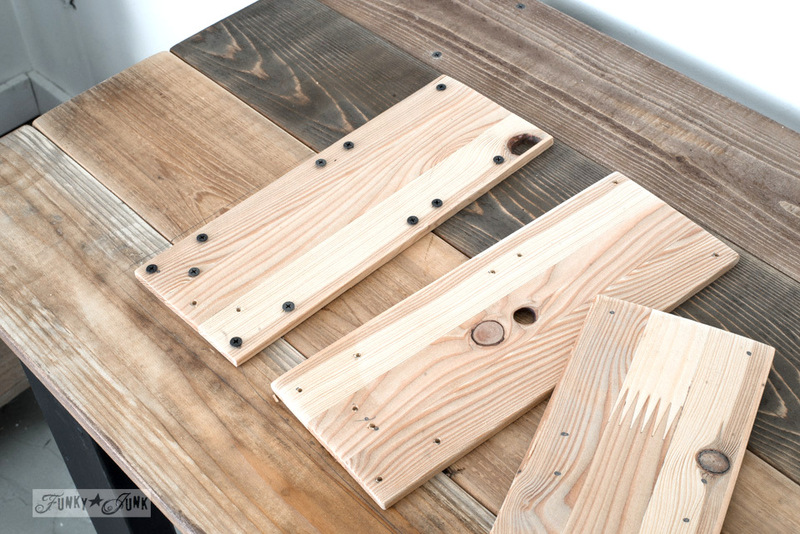 Attach 2x4s as legs to the front and back of the coffee table frame. I decided 2x4s would do for legs. 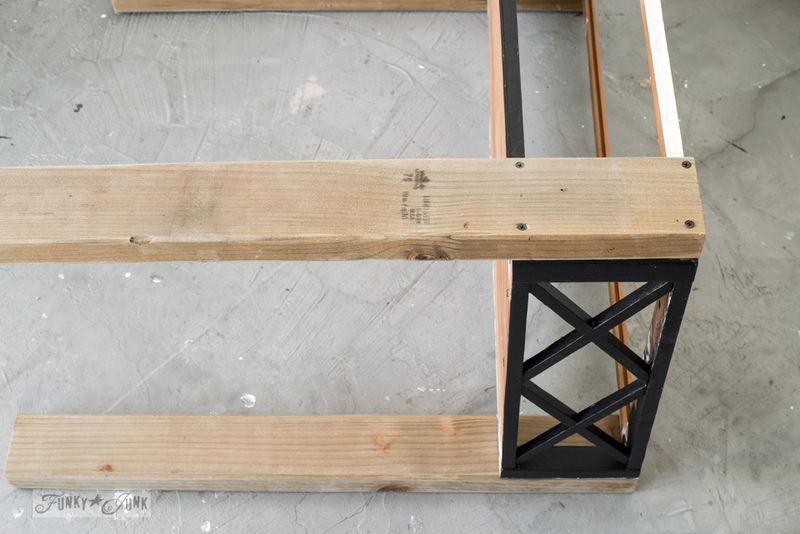 They were cut to desired length, then predrilled / screwed to the coffee table along the front and the back so the pretty fretwork to completely show. 4. Paint the coffee table and legs black. 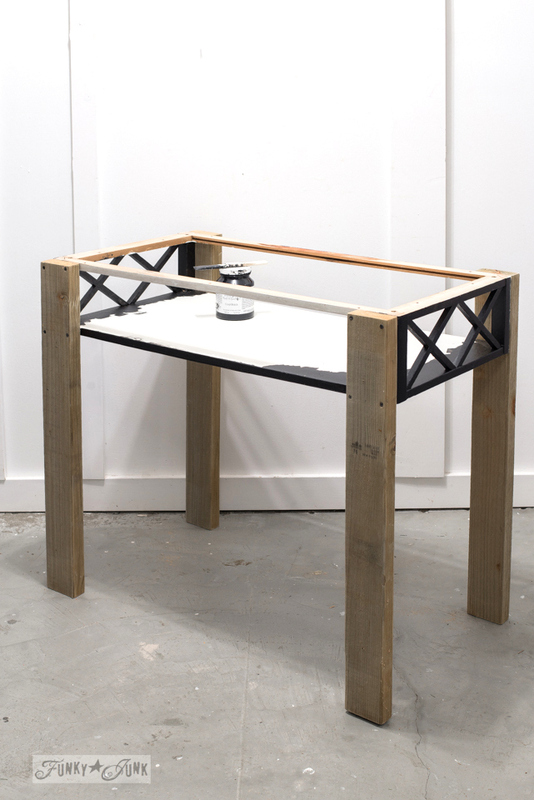 After the legs were installed, the coffee table and legs were all coated out in black paint. I used Fusion Mineral Paint’s Coal Black, and painted in a cross hatch method so a perfectly smooth finish wouldn’t be imperative. Great cheat if you worry about brush strokes! 5. Cut board planks to desired length for top. Sand well, then stain or wax as desired. 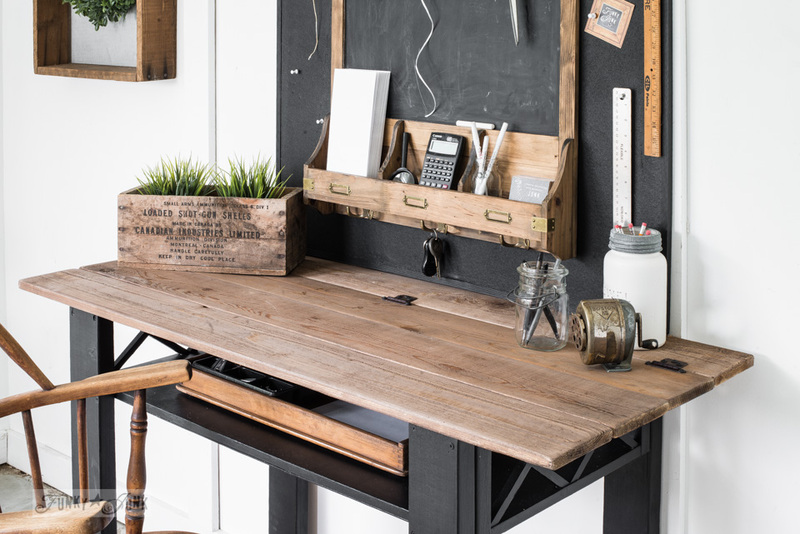 Four reclaimed wood fence boards were required to cover the top of the desk. 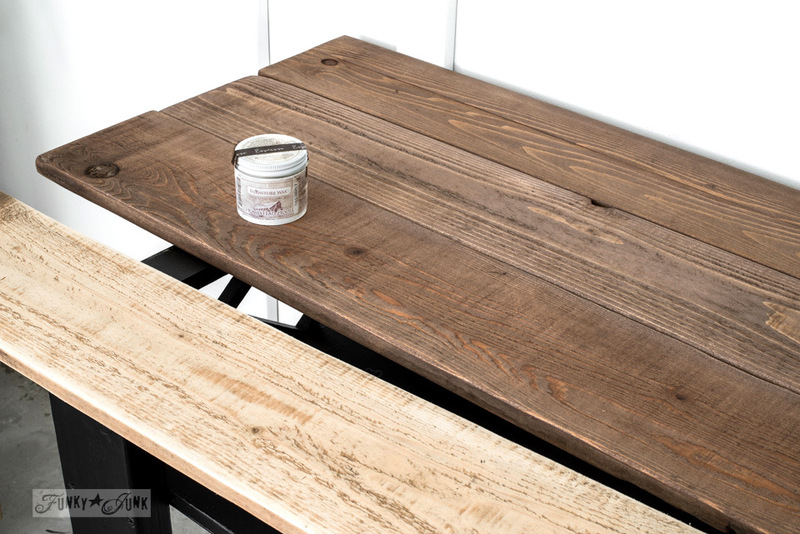 After cutting them all to the same length, they were sanded on both sides, then covered with a coat of Fusion Mineral Paint’s Espresso Furniture wax. It was the PERFECT gorgeous tone for this wood! Not too dark, not too light. 6. 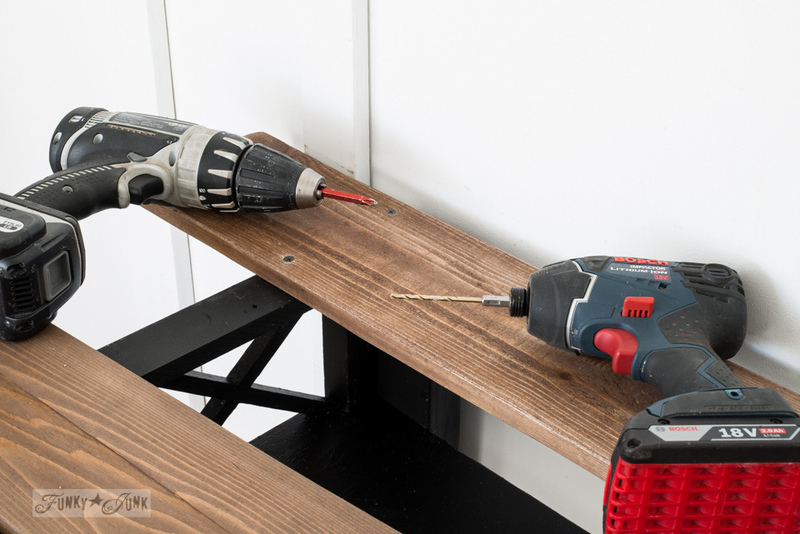 Move desk against a wall, then position one board flush to the wall and desk top with no overhang. 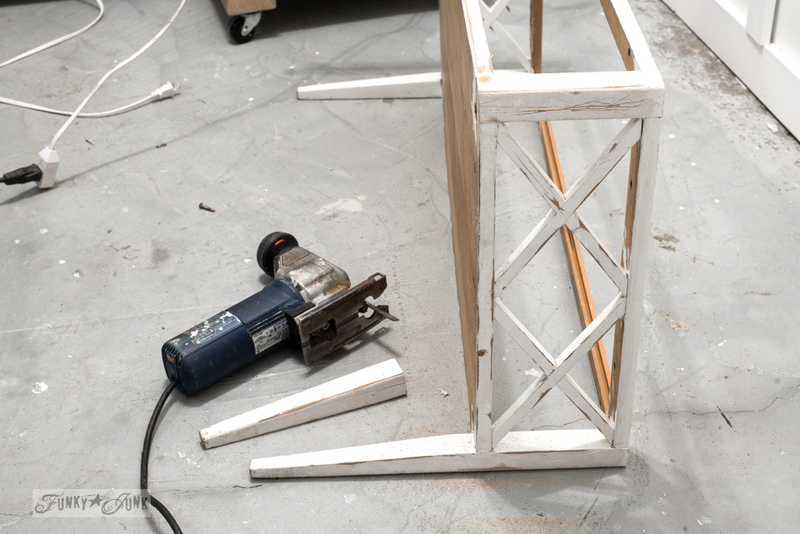 Pre-drill holes, then attach with screws. After I laid the planks on the table frame, I wondered how tricky it would be to find office supplies in a desk with no drawer. That’s when the brain storm ‘flip-top desk’ came into play. So the boards were positioned with the first one flush against the wall to anchor it moreso. However yours could be positioned with an overhang along front and back if desired. 7. 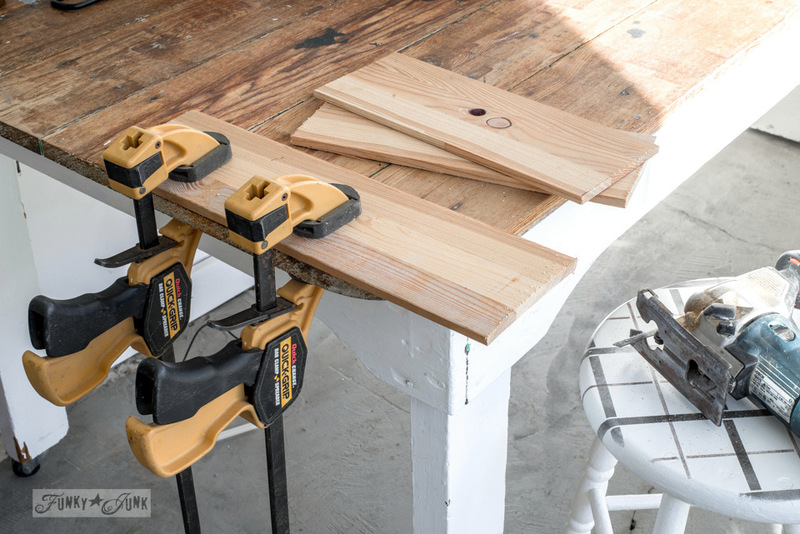 Create wood supports for the remaining flip-up desk top boards. Scrap wood was cut to size and sanded. Wider, lightweight strips were used to offer more support with less weight. 8. Flip the remaining desk top boards wrong side up, then slide them against the first attached board. 9. Position the support strips so they cover just the remaining flip-top boards. Predrill pilot holes, then attach with shallow screws. 10. Turn the flip-up top right side up, slide into place, then attach it to the main support board with two door cabinet hinges. 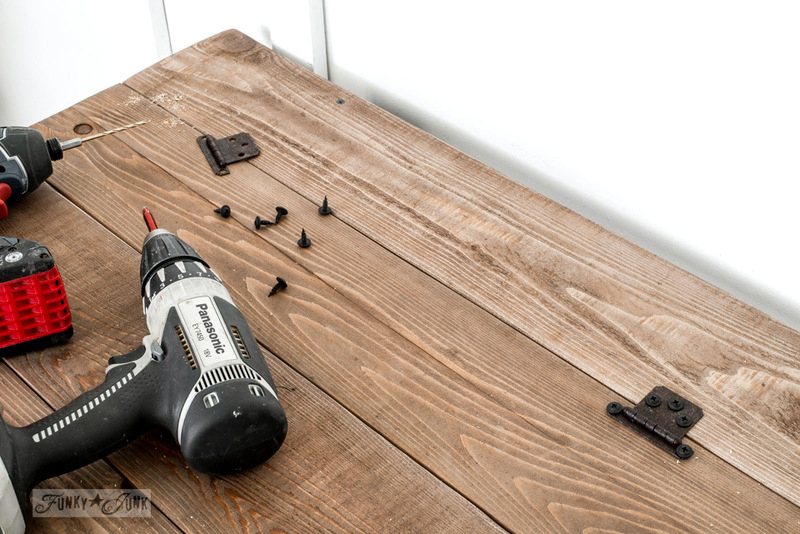 I predrilled holes, then used shallow screws so they wouldn’t protrude should one reach inside the desk. 11. 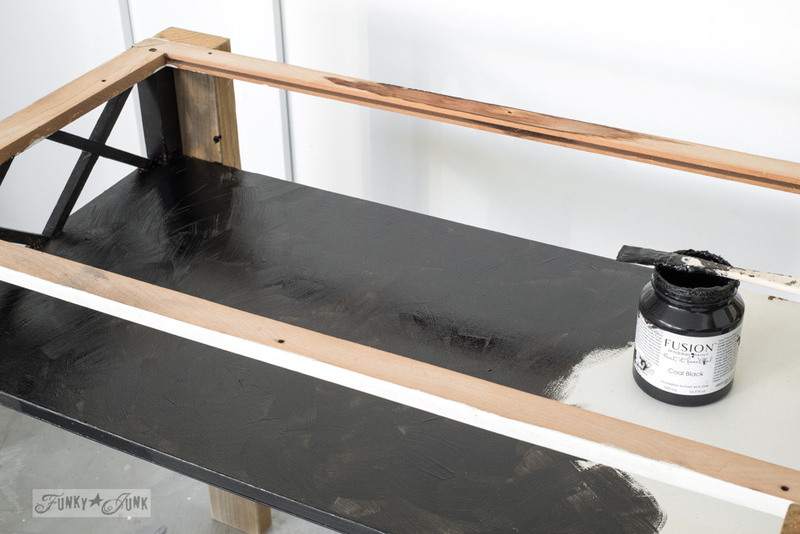 Paint a plain 24″ x 36″ bulletin board with black paint. 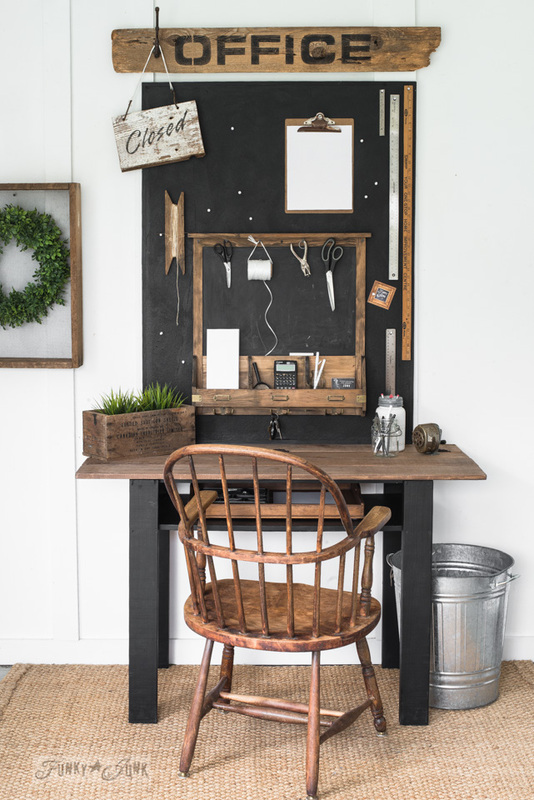 Desiring to keep the bulletin board super simple, a large bulletin board was coated out in Fusion Mineral Paint’s Coal Black, to act as a chalkboard too! After Fusion cures, it’s super durable and can stand multiple chalk drawings with no issue. 12. 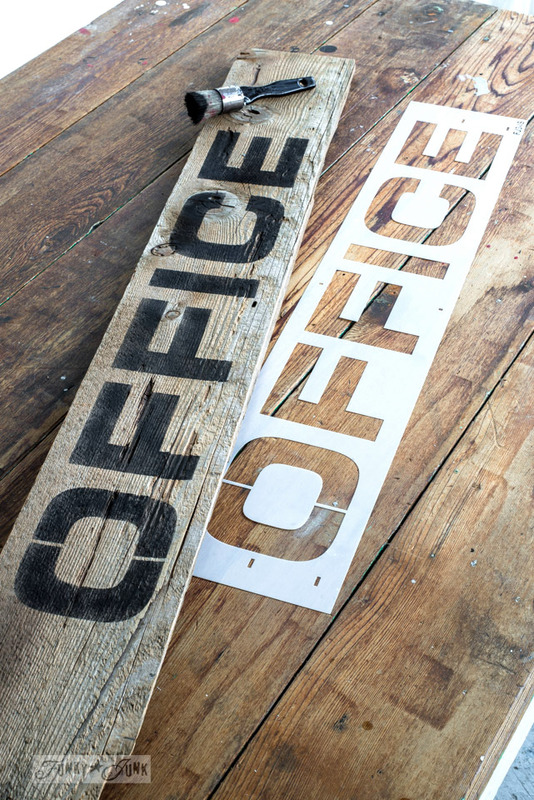 Create an office sign using a plank of wood and a stencil. Didja notice?! We have ourselves an OFFICE stencil! And we can thank the need for this desk for this design. 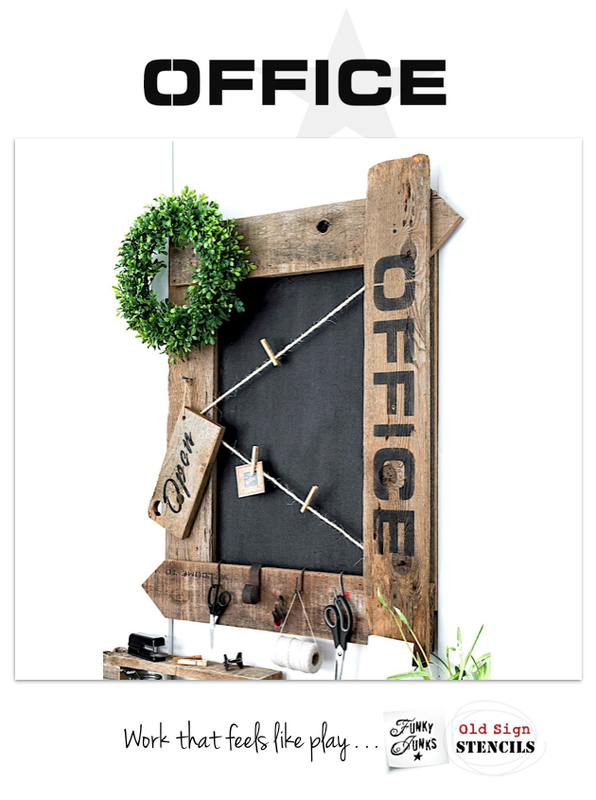 OFFICE comes in two sizes. I used the small for this project. You can view a shot of the large one used at the bottom of this post. Position OFFICE on wood, then masking tape it into place. 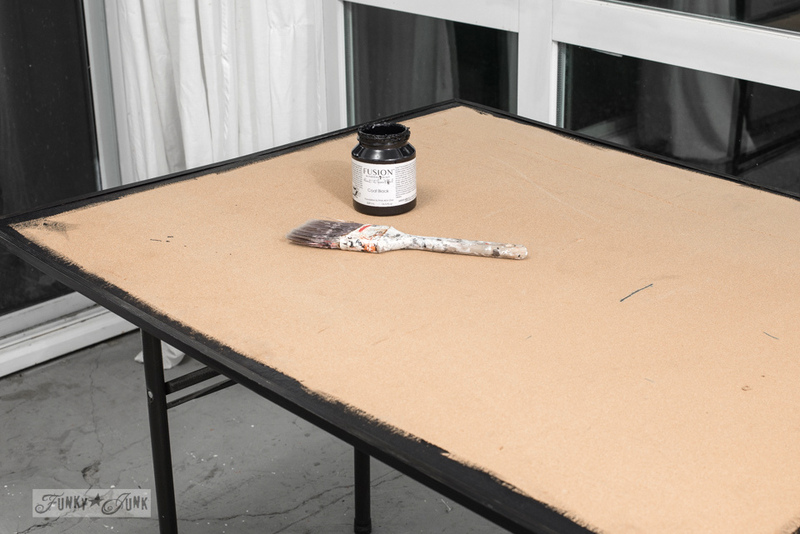 Load stencil brush with black paint, offload onto a rag to remove most paint, then stencil. 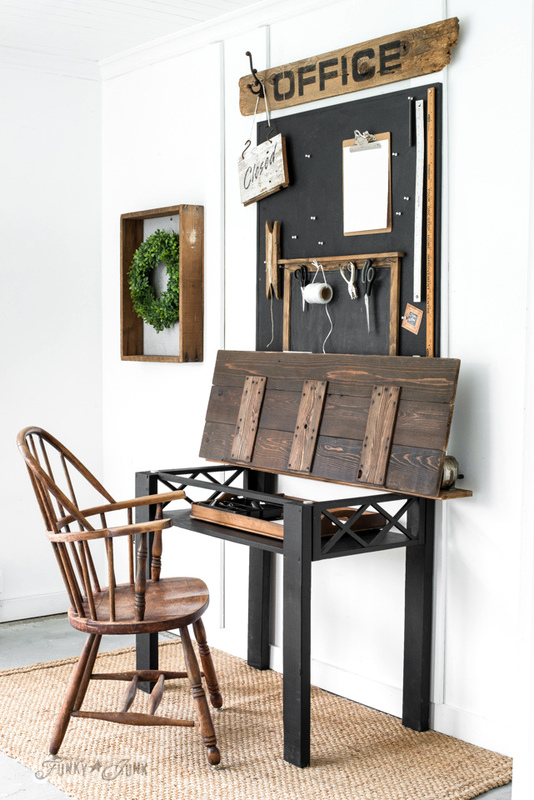 … to the cutest little flip-up office desk in the land! Since my son’s place was a rental unit, I didn’t frame the bulletin board, which may have added more holes in the wall. 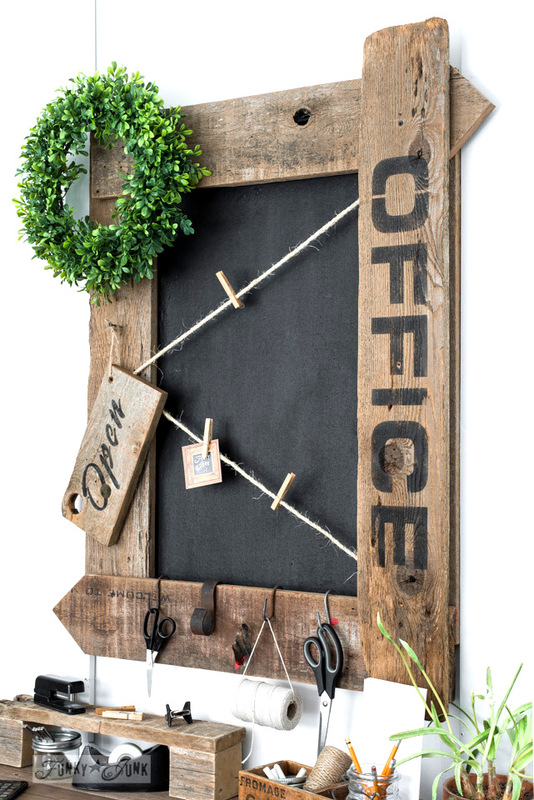 Instead, the bulletin board was enhanced with an interior mini chalkboard office organizer I landed from this junkin’ mission. It proved to be super productive and looked so nice in his place! And here is the top flipped up! 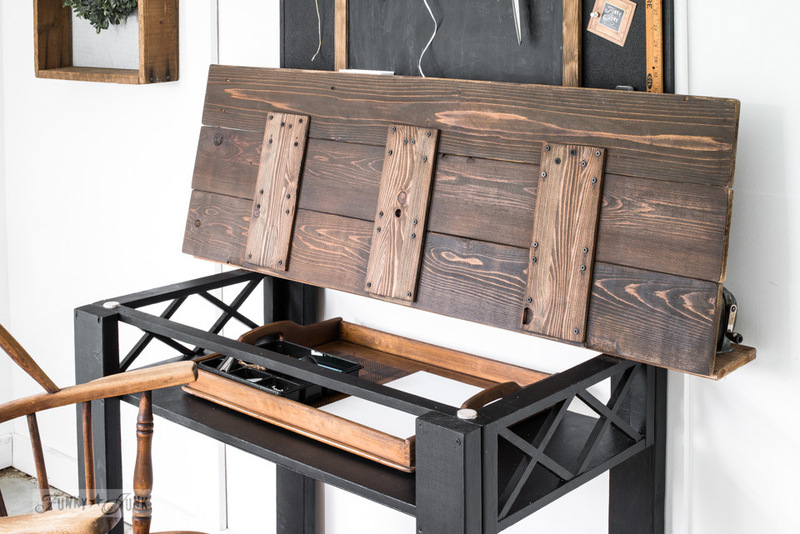 A buffalo checked tray was slipped inside the desk to act as a sliding drawer sorter for when there’s too much stuff on the top. Since I ran out of the wax I used for the top of the boards, I used Fusion Mineral Paint’s All In One Finishing Oil in Espresso for the back side of the flip top. It offered a deeper finish than the wax, however I felt that was fine. It turned out really nice. It also had no hugely bothersome odour that has you opening up all the windows! Cute, compact and ready to work! And then I delivered the desk to my son. And then he moved and I got it back! And then I decided to play a little more with it and couldn’t stop Office-ing. It was fun to use it as a prop again! 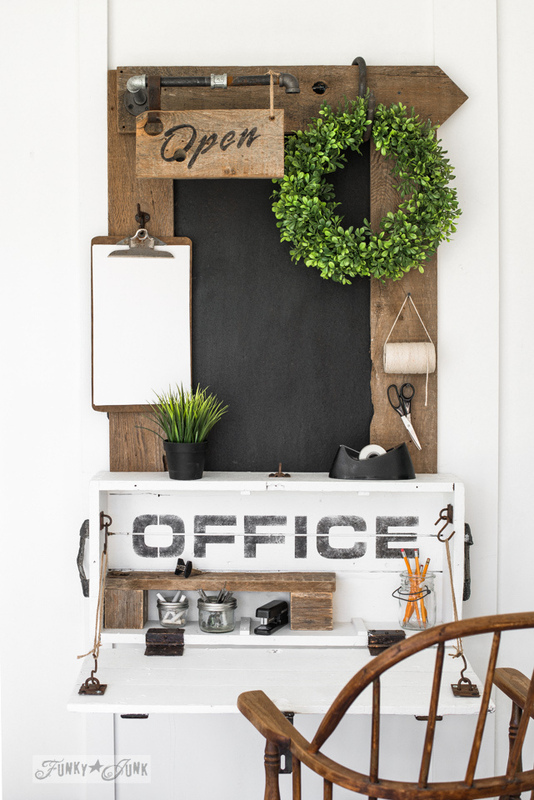 So in true blogger style, I ended up creating 3 other different office projects! 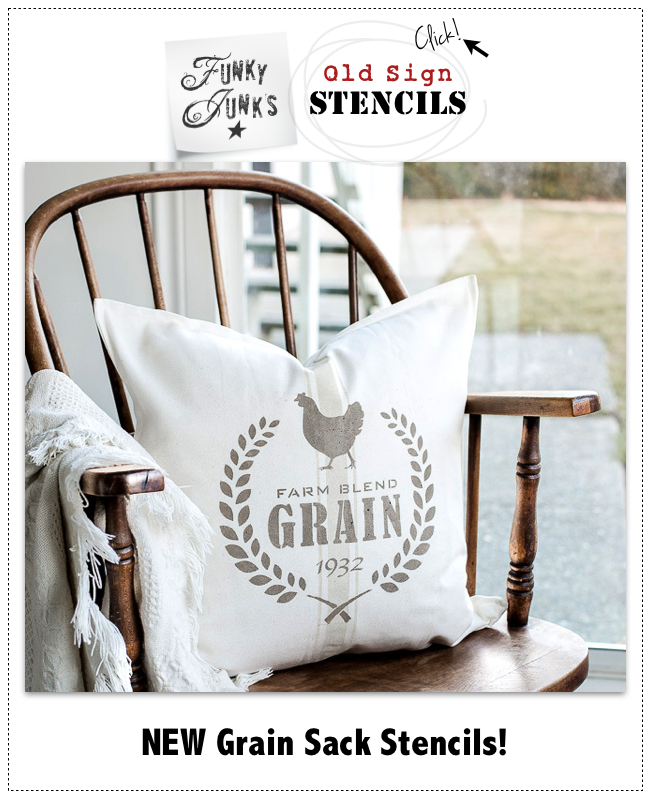 Nice upcycle and great stencils Donna! Donna, I absolutely love it !! I’m going to watch for a curb-side table for sure lol !! Haha! 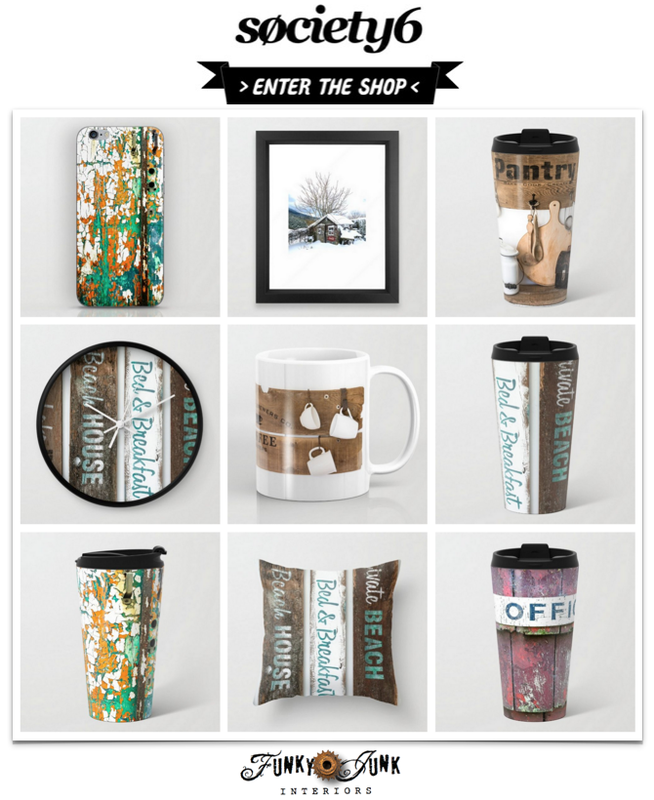 Gotta love a great curb-side shopping spree… summer is just around the corner and it can’t come soon enough! 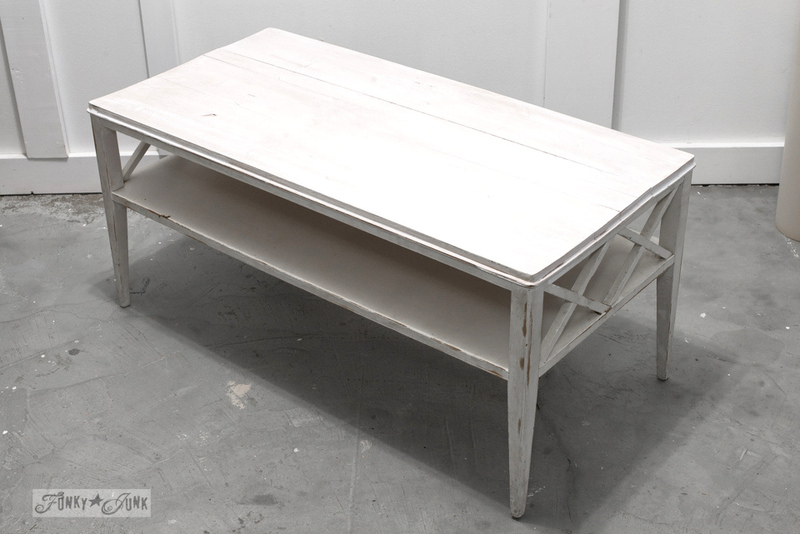 What a great way to upcycle that coffee table! 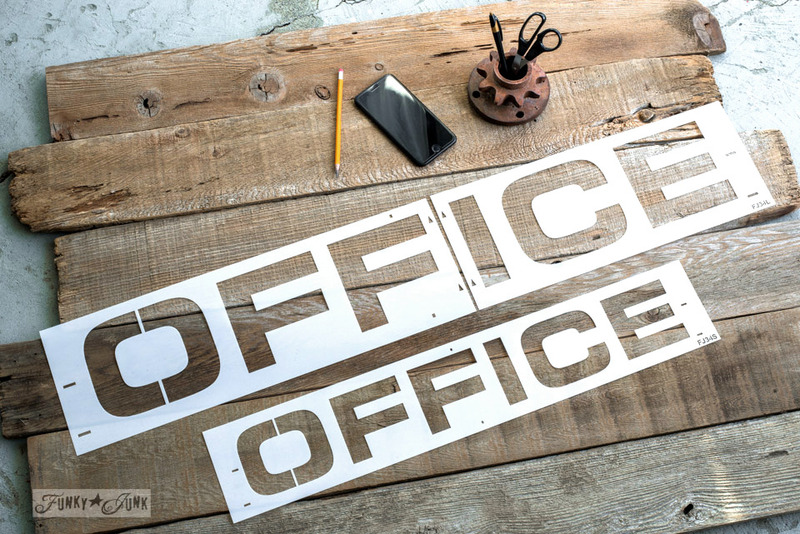 Outstanding work and what a great gift for your son, his Office is wonderful (I’m jealous)!!! 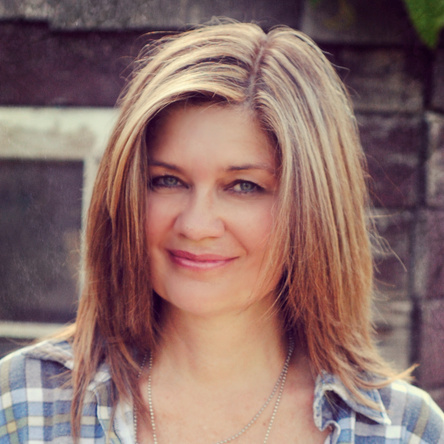 Thanks Teri! And yeah, it was a little hard to let go, seeing that the paint wasn’t even cured when I had to shove it into the back of my truck! It was fun getting it back to play with again. Hope he can have it back one day soon… we shall see! Until then, this junker is gonna use it every chance she gets! The desk is very inviting and fun. I like the galvanized trash can, too. This looks like a fun project. Desk is so much fun! Donna I love the black and wood look of the table. And the fact that it flips open is such a sweet surprise! Really nice, streamlined and purposeful desk. Your directions and pictures prove that building doesn’t have to be so complicated. I like it a lot, especially the espresso wax. Cool job Donna. 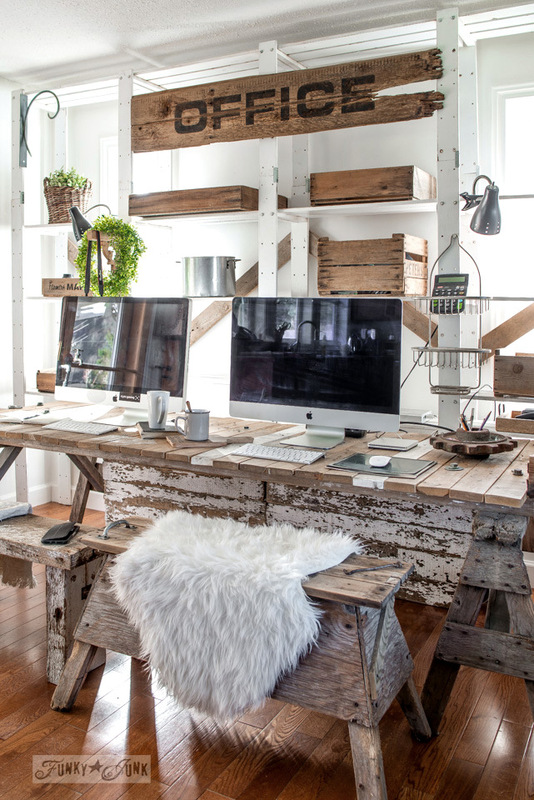 I love the desk and the stencil. You have such a way with styling you pieces for pictures. Of course, it doesn’t hurt that they’re all gorgeous on their own! Well done my friend! Genius! I would have never thought to put longer legs on it for a desk. I love it. And love the offfice stencil on the scrap wood with a coat hook. 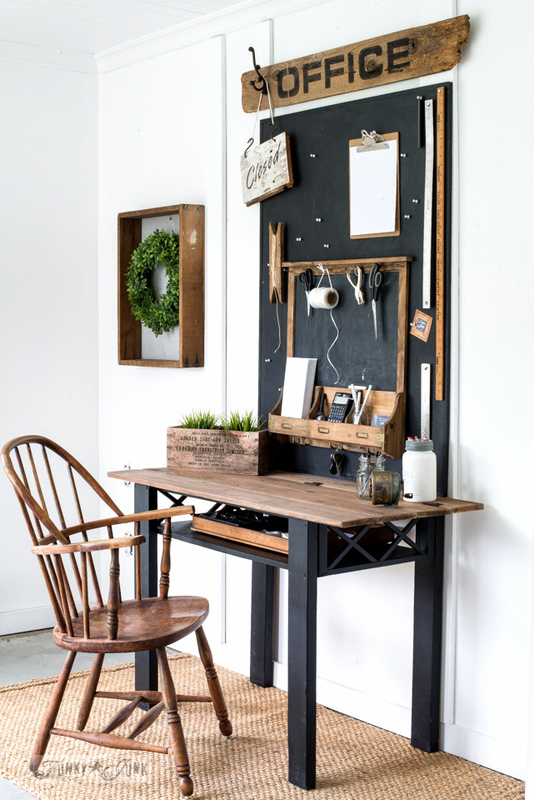 Styled beautiful with the chalk board. Thanks Peggy! Good ‘ol 2x4s proved to be sturdy enough and I felt it was great with the scale. I love it. Great desk!